Home > Membership > Nonprofit World > What Happens when Nonprofits Consolidate? (Either Partially Or All the Way)? 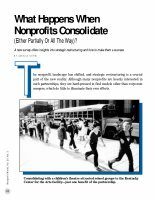 What Happens when Nonprofits Consolidate? (Either Partially Or All the Way)?